Kilimanjaro may be a dormant volcano, but it is far from a static place. New things are happening all the time as the mountain is shaped by fluctuating weather, the global economy as well as changes in the adventure travel industry. Here are three of the more recent and important changes that impact climbing Kilimanjaro. 1. Where did the trekkers go? There have been far fewer trekkers on the mountain the last 18 months. The reason is the fear of Ebola. Even though the March 2014 Ebola outbreak in West Africa was 4,300 miles from Kilimanjaro, it had a chilling effect on East Africa tourism. Trekking and safari companies sustained drops of 20 to 70 percent in 2015, and the effect has lingered into 2016. Many smaller companies have gone out of business as a result. Tusker founder Eddie Frank acknowledges Tusker’s business has been affected, but he is optimistic going forward. He foresees a return to normalcy in 2017 based on bookings taken this year for trips next year. “Ebola didn’t affect East Africa, but travelers went elsewhere a year ago and 2016 has been the aftermath year. Based on bookings this year, business should increase next year,” Eddie said. Until the Ebola crisis hit, East Africa’s tourism was growing at a healthy 5 percent a year clip. Kilimanjaro’s tourist counts peaked in 2013 with over 50,000 attempting to climb the mountain. The hottest debate on Kilimanjaro revolves around its melting glaciers. The mountain has become a symbol for global warming for over a decade, but are they melting down because of global warming or is it something else? Glacial scientists from several prestigious universities have noted that there has been an 85 percent ice loss between 1912 and 2011. A NASA report estimates it will all be gone by 2020. However, there have been many predictions about the glaciers disappearance for decades. In 1899 Hans Meyer, Kili’s first summiteer, thought the ice would be gone in 30 years. He was obviously wrong and Kili’s ice may be with us for a long time. Prof. Nicholas Cullen, a colleague of Eddie Frank, and a New Zealand climatologist has a different take on the ice melt, saying moisture variability is as much or more responsible for glacier loss as global warming. Less snow/rain recently has contributed to the shrinking glaciers and he rejects the notion that Kilimanjaro is a global warming flagship. With changing wetter weather patterns, Kili’s glaciers could actually make a comeback. 3. Is it a bird or a paraglider? Kilimanjaro’s era of paragliding is about to take off. 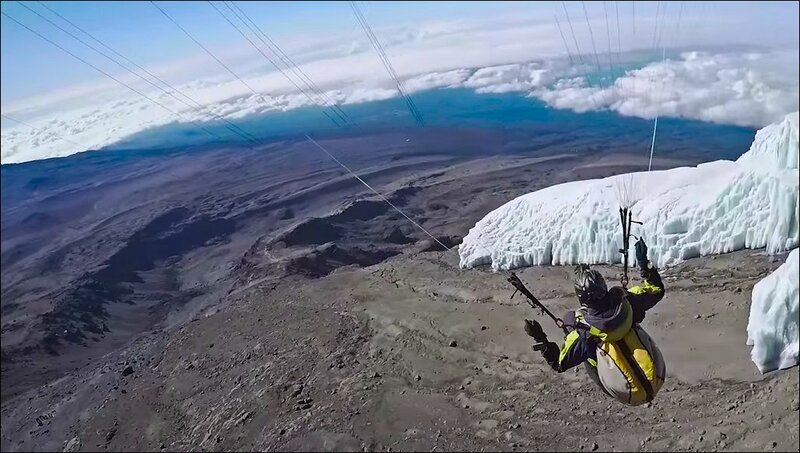 Wings of Kilimanjaro (WOK), an Australian company, has an exclusive agreement with Tanzanian officials allowing its clients to paraglide from an area just below the summit. Wings of Kilimanjaro has hired Tusker Trail to lead its most recent trips, and the team completed their fourth climb with Tusker in September. Tusker provides the climbing support, but WOK is responsible for the flying. Eddie expects the mountain to be opened to many more paraglider tours in 2017. Eddie does not see increasing paraglider activity as a problem or an eyesore. “These trips do not detract from the overall Kilimanjaro experience. They happen so rarely compared to the 40,000 trekkers whose impact is far greater,” he observed.